When you listen to instrumental music or a movie soundtrack in the background while you’re playing game, it’s very challenging to find music that fits a Cthulhu game. Part of the problem is that there are a lot of droning, repetitious soundtracks that sound the same from song to song. The other side to that, of course, are the soundtracks so recognizable that no matter how softly you play them, every one of your players knows what songs you’re playing. In gaming, music often plays multiple roles to heighten or enhance a mood, to “speak” to the theme of the game and to be playable whether the dice is rolling or not. In a lot of ways, music played for any game has to have a lot of variety because there’s a lot of activity going on in game that will “drown out” the music playing in the background. 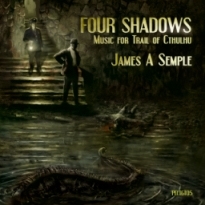 Trail of Cthulhu: Four Shadows is a collection of four songs designed to be played during your Trail of Cthulhu game. The titles of the songs are: Anagnorisis, Ruminations, Pulp Trail of Cthulhu Theme and Purist Trail of Cthulhu theme. The variations in the theme songs are for the two, different styles of play. I thought that these compositions fit the bill of what background music for gaming should be. Each of the songs has a broad focus with enough variety of sound and pitch to keep the music interesting. Ethereal choirs, a full symphony and some unusual sound effects flesh out the compositions, which average about three minutes in length. Priced at $4.75, the bundle comes with four songs and the CD sleeve. The nice thing about the way the compositions were designed, is that you could easily play the songs on “repeat” in your Trail of Cthulhu game and not get bored. Very professionally done, I really enjoy these instrumental pieces and have no criticism to offer. Look for more Gumshoe and Trail of Cthulhu products at RPGNow.com. I admit I’m a huge fan of background music while gaming. This looks like a fantastic addition to the collection.